Sometimes vibration problems only occur under certain conditions. Rpm, temperature and load are just some of the factors that could have a mayor influence on the vibration behavior of a machine. A Turbo-Generator could run perfect for many hours after which only a small load change triggers very high vibrations. 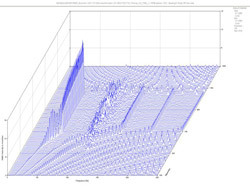 These changing conditions are measured and analyzed using transient measurements. During a transient measurement, the raw vibration signal is measured with a high sampling frequency. The period over which the signal is measured can vary from a few seconds till minutes or even hours. A complete analysis at a later moment will then exactly indicate what changes take place at what moment. 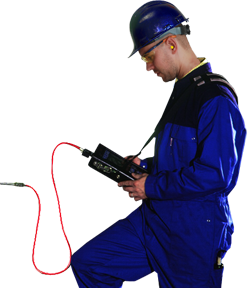 Transient measurements are usually performed on installations with a non constant vibration behavior. This can be during the run-up or coast down of a machine but also during changes in load or operating temperature or product. 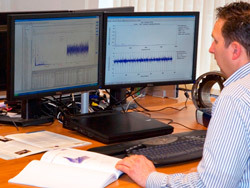 Also for the commissioning of new or overhauled machinery are transient measurements often used. By monitoring the start-up, the ramping of the load and the warm-up of the machinery, any possible problem will be detected and the start condition will be well documented. Not only can the problems that are directly related to the rotating machine be diagnosed. Also other mechanical problems have been tackled with the use of transient measurements. In one case normal vibration measurements and multiple visual inspections couldn’t give a clear cause for the many broken support shafts that occurred. Only after transient measurements where performed during the whole product cycle, large irregular shocks were detected during the warm-up and cooling down of the product. These shocks only occurred when the machine was fully stopped. An analysis of the shocks in combination with the product cycle indicated thermal expansion and shrinking for which the installation wasn’t designed. Specific design changes where implemented to compensate for the thermal effects resulting in a now more than 10 years problem free installation.